Pepero Day is a South Korean holiday on November 11th (11/11), where friends, couples, and family give the gift of Pepero to their loved ones – it’s kind of like Valentine’s Day! You might be wondering what exactly is Pepero (빼빼로)? The standard Pepero is a stick-shaped biscuit dipped in chocolate. Besides the ubiquitous chocolate flavor, Pepero comes in other yummy flavors like almond, strawberry, and melon just to name a few. These snacks may sound familiar to you if you’ve heard of its Japanese counterpart, Pocky. 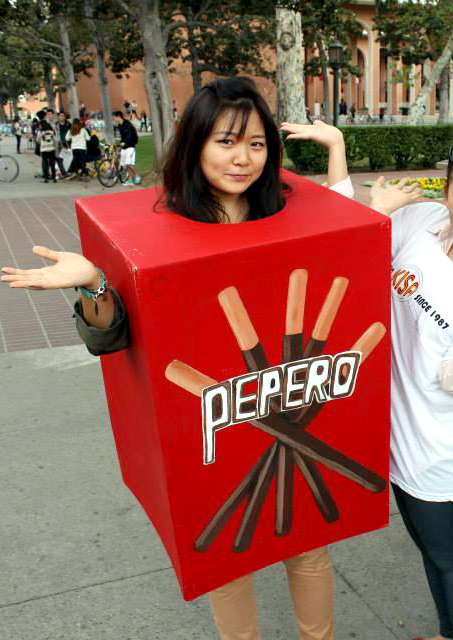 My friend dressed up as a box of Pepero for Pepero Day! 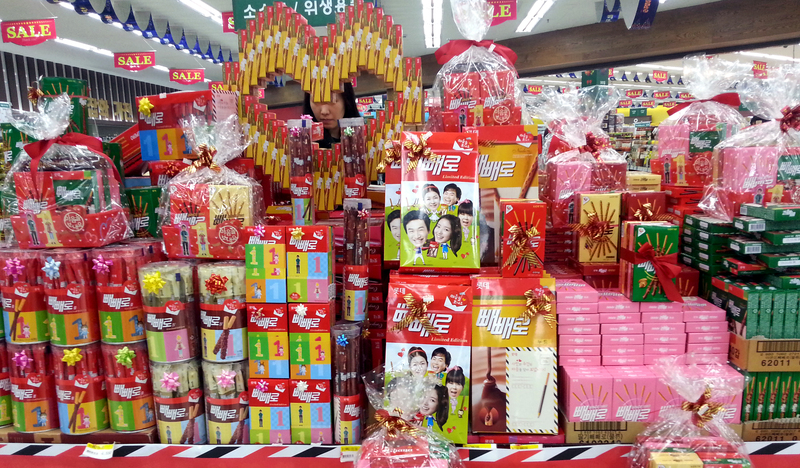 Pepero Day is now a widely celebrated holiday in Korea. What initially started as small exchanges of a pepero box or two to friends and family now has evolved into a Pepero movement, where elaborate heart sculptures are cobbled together from Pepero boxes as fun gifts and never-before seen limited edition flavors are launched just for this day. Stores feature fancily-packaged gift sets that contain stuffed toy Pepero sticks and extra-large sized Pepero (as long as your arm!) as well as fun DIY Pepero kits. Besides the sentimental sweets, couples and friends also exchange heartfelt letters and notes. As for how the holiday began, the myth goes that two schoolgirls exchanged boxes of Pepero to eat at 11/11, at exactly 11:11 am to symbolize their eternal, unchanging friendship. Another popular theory of the origin of the holiday is that 11/11 resembles four sticks of Pepero in a row. Not only is Pepero Day a day to indulge in a few boxes of these treats, but a fun, light-hearted way to express thanks and appreciation to those you love. Join us in celebrating Pepero Day! We’ve partnered with one of our favorite companies, Snackfever to create a limited edition box just for for Pepero Day! This limited edition box has 5 surprise flavors of Pepero + 3 fun sheet masks & a glow-boosting ampoule pad – perfect for an indulgent Pepero gift to yourself or to a friend.